Oceanview started over thirty years ago in Southern California when a young school boy, Peter Michelmore, was fascinated by the local construction workers and ended up helping one tore down a house. Later he helped a roofer for the summer, which turned into a high school job. Before he graduated, Peter was running roofing crews while his boss made sales. In 1992, Peter moved to Oahu and worked for local roofing companies for five years before he could relocate his local roofing company here. 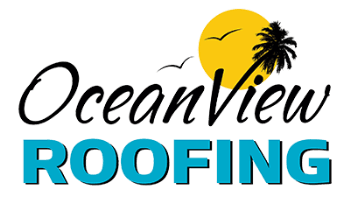 One of the secrets to Oceanview Roofing’s success and satisfied customers is their roofers. “Our roofers have medical benefits and are paid well. When we look after our roofers, they look after your roof.” says Peter. This strategy, and commitment to quality work at a fair price, has propelled Oceanview Roofing to consistent 5 star ratings on Yelp. 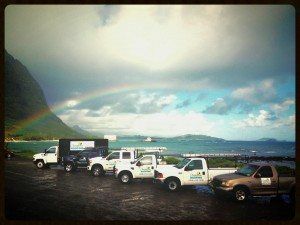 We don’t skimp on material or workmanship, and pride ourselves on delivering superior products and services at rates that are more than competitive for the island of Oahu. Our goal is to exceed customer expectations on every roofing job we undertake, from new installations to extensive repair jobs. Peter Michelmore was a featured guest on Hawaii Money Resources hosted by Marko Mijuskovic recently. Contact Peter at Oceanview Roofing: 808-234-1000 for all your roofing needs. Proud winner of the “2015 Residential Metal Roofing Contractor of the Year Award“. Click the link to see the award winning home! Quality. We only use quality materials and pay close attention to details. We have extensive experience working with: Standing Seam Aluminum, Concrete & Spanish tiles, aluminum, wood shakes, asphalt shingles, & flat roof coatings. 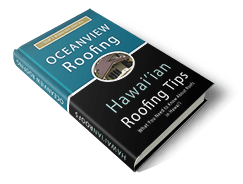 How is roofing in Hawai’i different? In tropical climates, you have to choose a roofing product that will withstand the extremes of strong winds, excessive rain, heat, sun and salt air. Many roofing products will fade, peel, chip or crack in this weather. At Oceanview Roofing, we can guide you through the process to help you find the best quality roofing products that will provide you the best protection possible for your budget. Call us today at (808) 234-1000 for a no-obligation, FREE estimate for repairing or replacing your roof. What is the Best Roof For Hawai’i? Aluminum Roofing has the best long term value for your investment and Hawaii’s harsh tropical climate. If you’re like most, your home is your most valuable asset. And you’ll do anything to protect it. Aluminum metal roofs are built to last. In fact, they’re so durable that when you replace your roof with an Aluminum roof, you’ll never have to re-roof again. NEVER. Oceanview Roofing is the certified installer for Aluminum Roofing in Oahu. This rating is not necessarily a true indicator of the strength of a company because BBB is a private self-governing entity which companies can pay for a membership. However, if a company has unresolved complaints, this can be a warning sign. Best to check if there were multiple company names.